Disclosure: This post may contain affiliate links. The opinions are my own. I absolutely love the fall season! 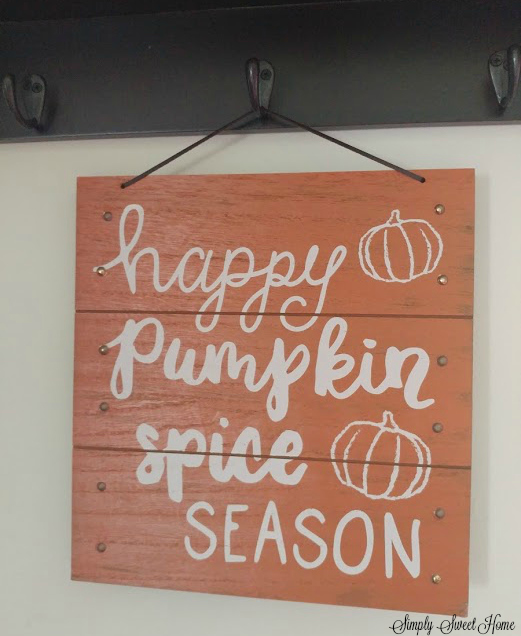 And I love decorating for fall almost as much as I love decorating for Christmas. As I shop I see so many cute finds at great prices. There’s so many great deals out there that there’s really no good reason not to decorate for the season. 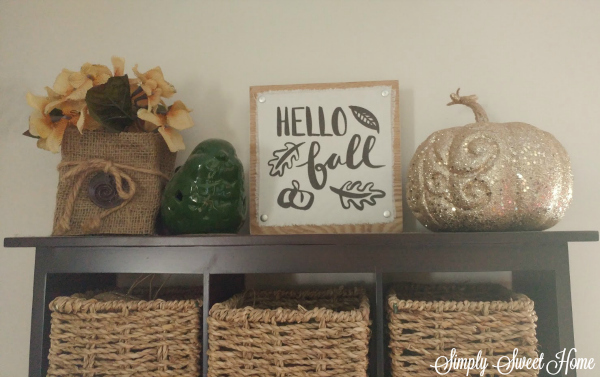 Today I’m going to show off some of my fall decor and tell you some of my favorite places to find fall decor on a dime! 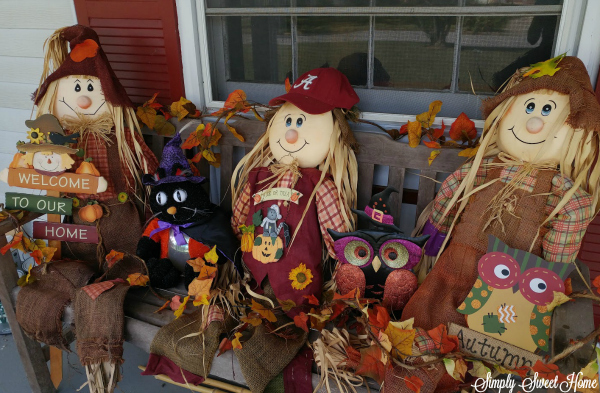 I’ve had my scarecrows for several years, and I love setting up this porch so these guys can greet our guests. 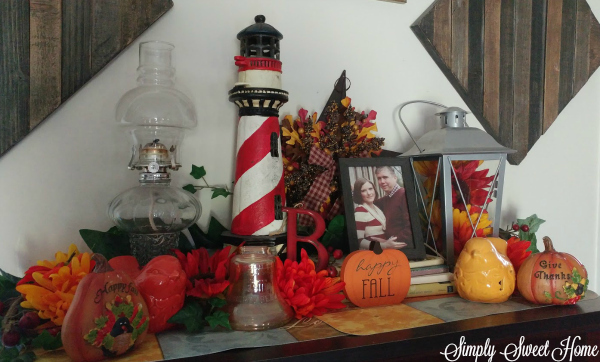 Just add some faux leaves, pumpkins, and a few other pieces, and you’ve got a great scene for family photos. The bird and flower stay on this shelf year round, but I originally bought them during the fall season. 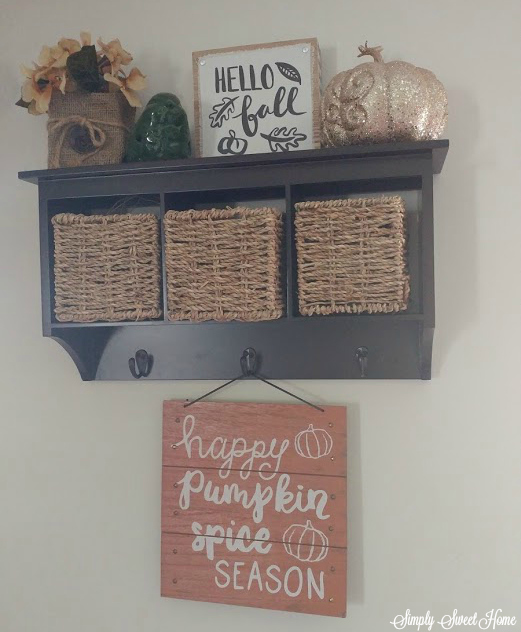 Those, along with the pumpkin, in this photo came from Family Dollar, and the Hello Fall sign was another $3 Target find! This wall shelf also came from Target. I had no intention of decorating this bookshelf. 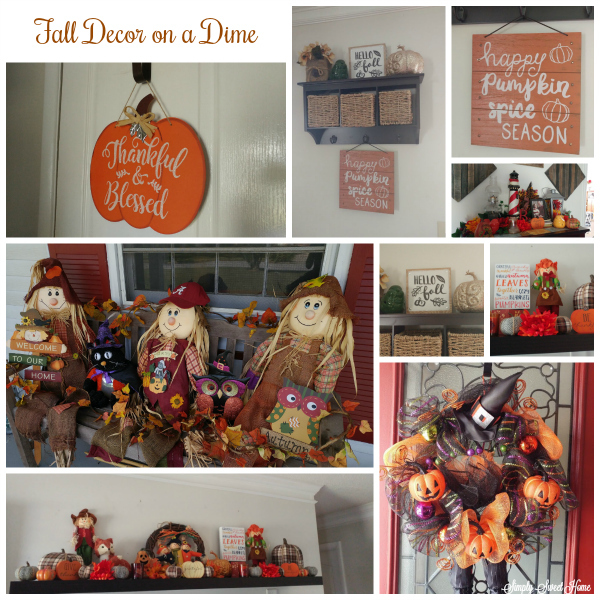 Most of the items shown here are there year round, including the birds which were another fall find at Family Dollar. I believe the pumpkins on each side came from there as well. 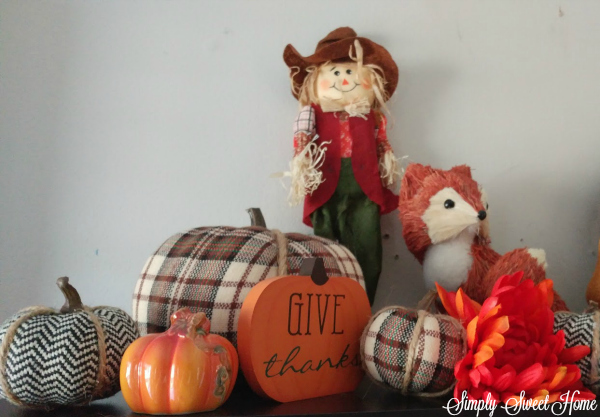 The fall star in the back came from Oriental Trading, and the Happy Fall pumpkin is from the Dollar Tree! I’m most excited about my new floating shelf. I used to have a China cabinet and an entertainment center. Both of these had shelves that I could put my decor on, and I miss that! Finally I broke down and bought this shelf. 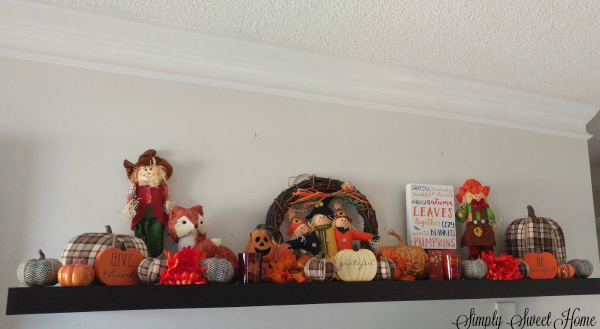 My favorite things on this shelf are the plaid pumpkins. They came from Target. The little black and white pumpkins and the subway art came from their as well. 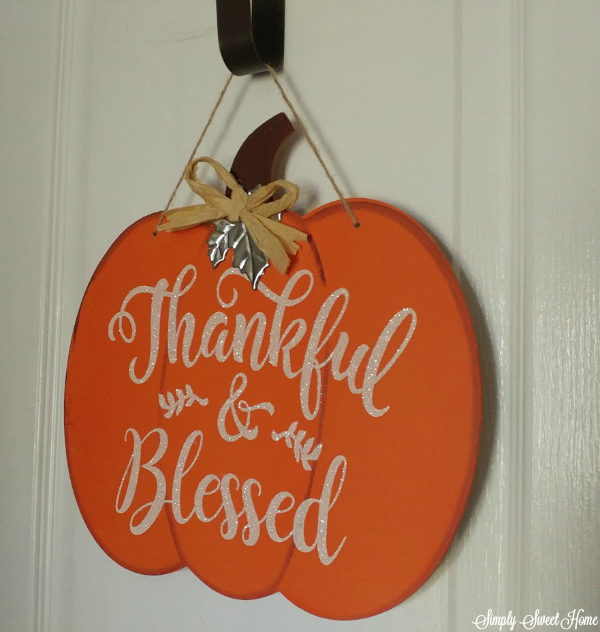 The wooden pumpkins that say things like “grateful” and “give thanks” came from the Dollar Tree. 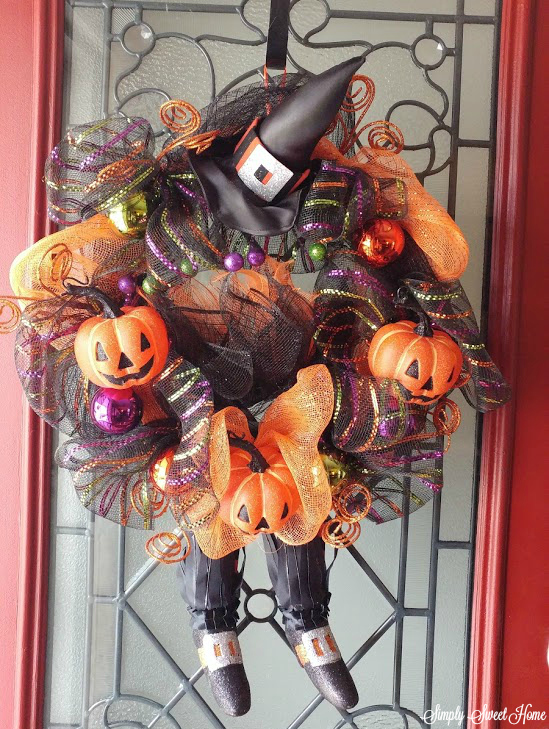 And most of the other decor came from Family Dollar. 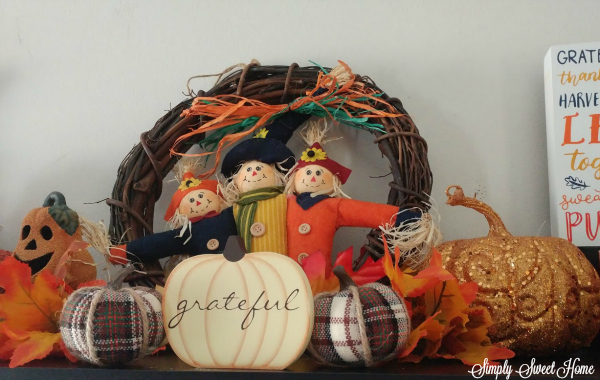 Where do you shop for fall decor? Do you have a favorite decor item or trend?